Well, well, well. Finally, after quite a some time, Karan Johar is BACK. Expectations are always very high from his movies, and KANK is a no exception to this. 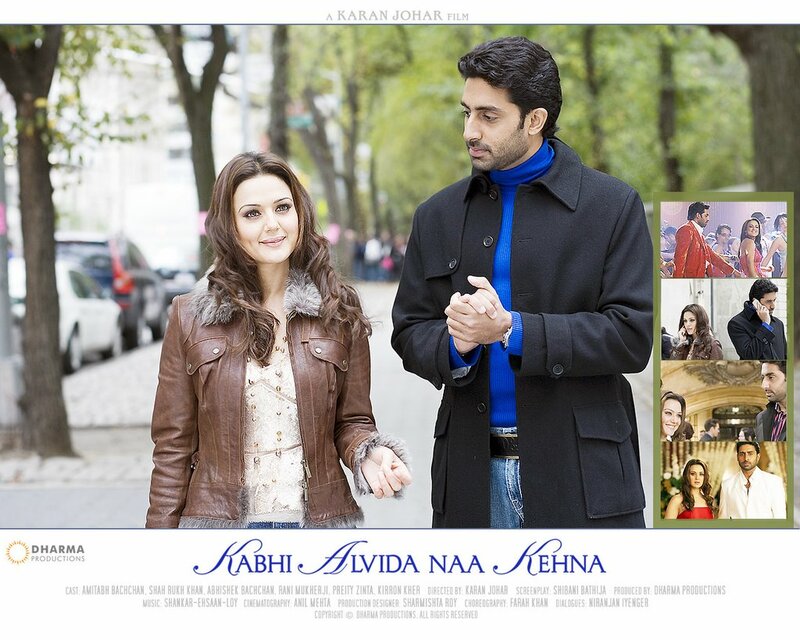 Music has been the soul of his movies, so its obvious to wait so eagerly for KANK album too! There are seven songs(5 songs actually + 1 remix + 1 instrumental theme)in the album. Lets feel them one by one. PAST: This song (as is expected) is inspired by Kal Ho Naa Ho-Title track. The basic beats of the song, Sonu's renderation, the tempo of the song...everything reminds you of the KHNH's majestic title track. PRESENT: Despite having few similarities, this song is a fundoo! number. VERY SOULFUL, VERY TOUCHING. SEL(read:Shankar Ehsaan Loy), has weaved Jaaved Akhtar's beautiful words brilliantly. You would not expect a sad song to be title track of the movie, but this song is so soothing that it is surely up to the expectations! FUTURE: This is a sure-shot hit! I can bet on that. And, let me tell you that like KHNH, this song is going to be remembered for a very long time. PAST: .....Nothing. This one is as fresh as a cool sea breeze. PRESENT: Now-a-days, it has become a very common trend that Pakistani or Bangladeshi singers are singing in bollywood movies. Shafaqat Amanat Ali(Fusion! band fame) has got his chance this time and his luck has hit bang on target, by getting such a lovely song. A well paced song, which have the added advantage of beautiful guitar work and indian instruments. It also has a remix version of it, Mitwa revisited, which is going to rule the discos for sure. FUTURE: Block-buster of 2006. This song is certainly going to top the charts. PAST: Inspired by 'Its The Time To Disco'. Same theme, same singers but different song! PRESENT: A rocking song, surely aimed for the discos etc. Very well written, very well crafted by SEL and equally well sang by Shaan and Vasundhara. Western instruments also tend to give it a next-genre-feel. Nice song. FUTURE: Will not be able to match 'Its the time to disco' status. PAST: 'Kuch Toh Hua Hai' feel. But, way better than that. PRESENT: A soothing melody, this song goes straight into the heart. Sonu and Alka, again proves their metal at soft romantic numbers. Though the lyrics are pretty ordinary but this song hold your attention. A prayer for lovers...go for it. FUTURE: Will not be a chart-topper. But, can go upto great heights. PAST: The 'dhol' and other musical instruments, reminds of 'Pretty Woman'. But, except that, this song is quite an original one. PRESENT: Nice blend of western instruments(Rock'n Roll tunes) and melodious Indian traditional music. One or two lines of old song(like Sar Pe Topi Lal Haath Mein Resham Ka Roomal etc) in between, proves to be added advantage for its melody-value. FUTURE: This song is going to rule discos/parties/lounge etc. With good publicity, 'Rock'n Roll Soniye' can achieve the feat achieved by 'Kajra Re'. (when I heard this song for the first time, I gave it a rating of 3.5, after listening to it for 2-3 days, the rating went to 4, then 4.5, and, finally NOW after 4-5 days...this song has become my favourite song of the album after Mitwa and KANK(Hey, wait! may be after 2-3 more days, this song will overcome them, who knows? :). Overall, its a brilliant album. Great music, OK lyrics, Beautiful singing + the Karan Johar X-Effect. HIGHLY RECOMMENDED !! !